Having builders and painters in our property sounds as a really good idea. Renovating services always apply new ideas and different vision. Even thought no matter the level of the service implementation if not cleaned professionally your property new look might never fit your visions. With us it is easy to solve the problem. We have special cleaning team professionally equipped and ready to apply a hight quality level for After builders Cleaning Services on reasonable prices. With our long experience in this environment we are prepared to meet all kind of requirements. The rubbish from your building work will be removed. Floors and carpets will be professionally cleaned. 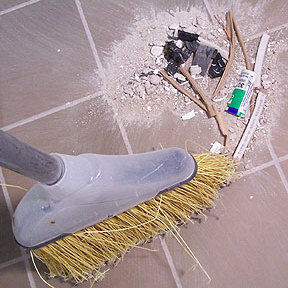 We will remove dirt and dust, de–line and de-scale any bathroom or kitchen tile, polish surfaces. Deeply clean floors, stairs, toilets, sinks, kitchen, bedrooms, living rooms, common areas, cupboards in and out, walls, ceilings, switches, sockets, fixtures, door frames, doors, skirting boards, windows, sills. Any leftover paint or plaster will also be removed. During our After Builders Professional Service we are able to cover even more different services such as Steam Carpet Cleaning. It all depends on you. So just give us a call, for a professional advice and service discussion.